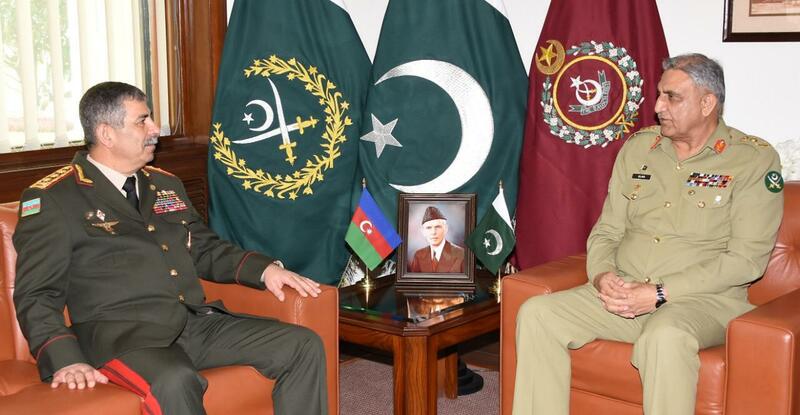 Azerbaijan Defense Minister Colonel General Zakir Hasanov on Friday called on Chief of Army staff (COAS) General Qamar Javed Bajwa at the General Headquarters in Rawalpindi, said Inter-Services Public Relations. According to the military’s media wing, matters of mutual interests, regional security, defence cooperation and other issues were came under discussion in the meeting. During the meeting, Colonel General Zakir Hasanov lauded Pakistan’s efforts for regional peace and stability. Later, he laid a floral wreath at the Yadgar-i-Shuhada (Monument to Martyrs) at the GHQ. Meanwhile, the Inter-Services Public Relations (ISPR) released the official anthem for Pakistan Day. Military spokesperson Major General Asif Ghafoor posted the anthem video on his official Twitter account. The anthem, titled Pakistan Zindabad, is sung by eminent musician Sahir Ali Bagga and pays tribute to the armed forces and different walks of the society, including the media and sports. The ISPR has released five promos earlier in connection with the military parade today. In the meantime, Pakistan Air Force (PAF) takes pride in launching a new motivational song (Shaheen-e-Pakistan), on the auspicious occasion of Pakistan Day. The song has been sung by the renowned Pakistani vocalist Atif Aslam and lyricist Ehsaan Abbas, who is a serving airman of PAF who has already written one of the most popular songs of Pakistan Air Force on Defence Day 2016. The song is a tribute to the services of all rank and file of PAF and highlighted the acts of valor displayed by gallant PAF Air Warriors during the recent conflict with the enemy. In the earlier released promos, citizens of Pakistan, players, mediamen and the artists were seen showing their love and affection with the motherland.